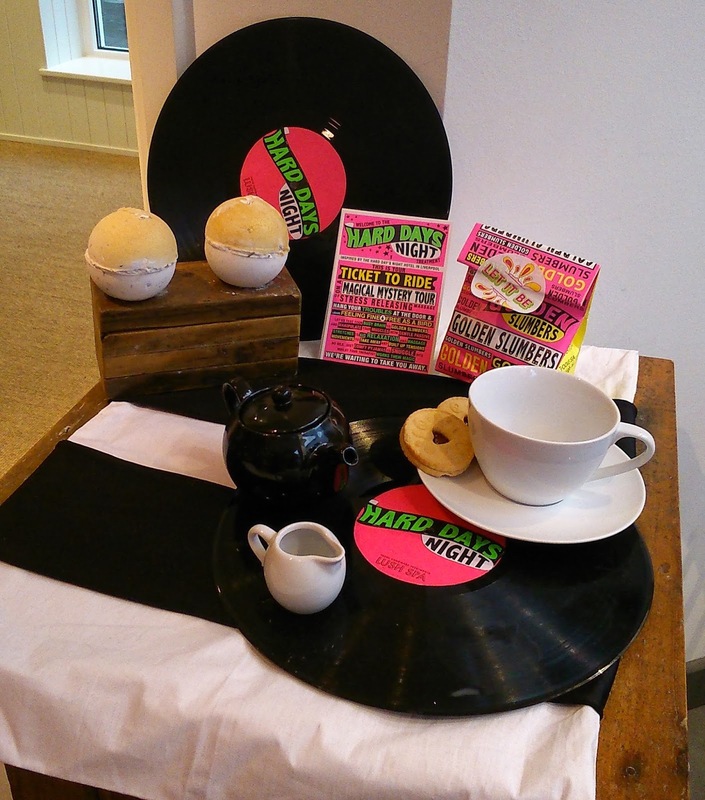 A Fabulous Spa Treatment to the Music of the Fab Four! I'm not a fan of massages. I have very sensitive skin, I bruise easily and I don't like being prodded or poked. 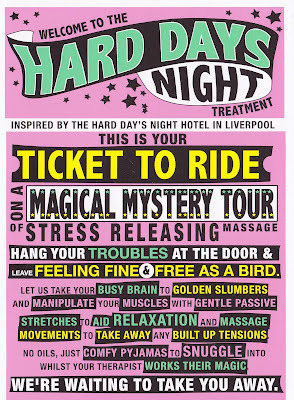 Therefore I was rather nervous when I was invited to try the new Hard Day's Night treatment at the Lush Spa in Liverpool. 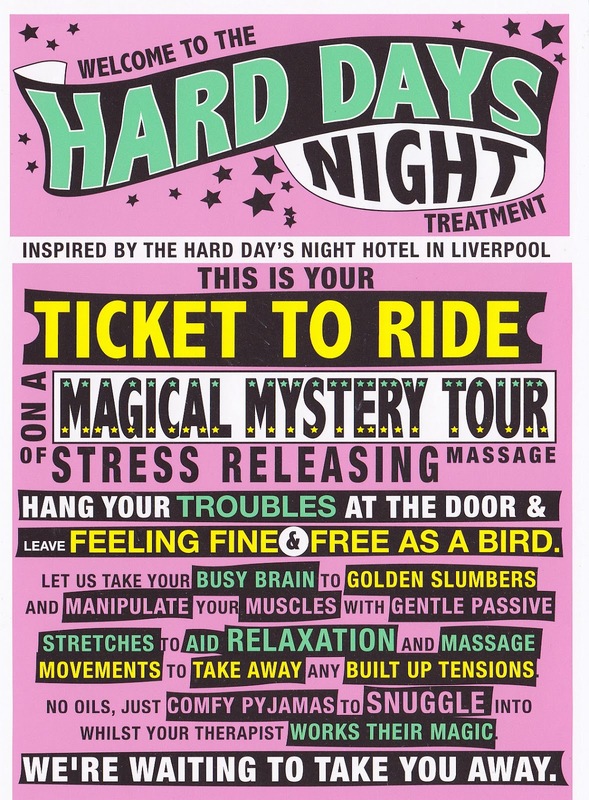 My nervousness was compounded when, at the launch event at the Hard Day's Night hotel, we were told that this could be quite an intensive massage and that it could be quite uncomfortable at times. If I'm totally honest, as I walked up the stairs to the spa on the day of my appointment, I was dreading what was to come. However, within minutes my fears started to melt away, and before long they were gone completely. Before the treatment started Helen, who did my treatment, sat and had a chat with me. I completed a medical questionnaire and explained how nervous I was. She told me not to worry, and reassured me that all treatments could be tailored to people's individuals needs. 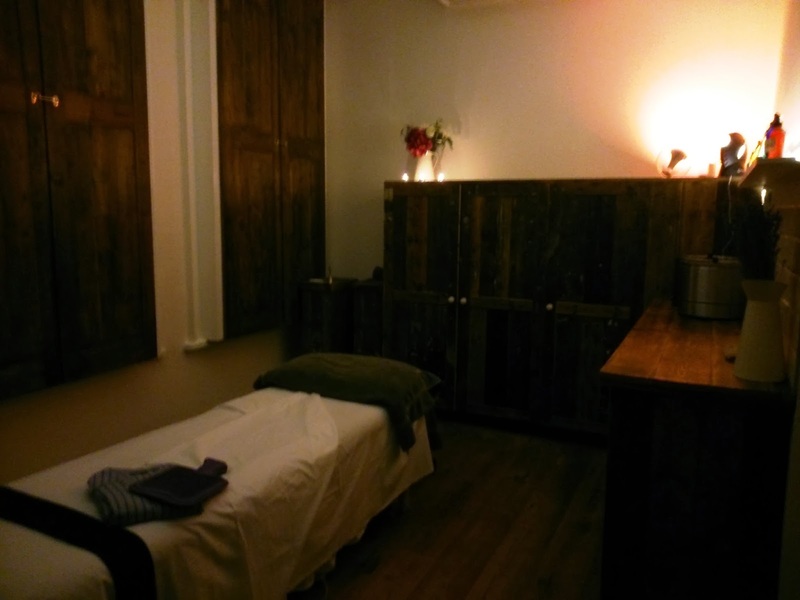 At the launch event, we were told that the aim of the treatment was to take the client from the stresses and strains of every day life to being so relaxed that the temptation is to fall asleep, and every stage and element of the treatment worked to do just that. Once inside the "Hard Day's Night" treatment room, I changed into pyjamas that had been wrapped around a hot water bottle and so were lovely and warm. The layout and lighting in the room added to the peaceful and relaxing atmosphere, and feeling cosy and warm I settled down on the massage table. The whole of the treatment takes place against a background of Beatles music that has been arranged by Simon Emmerson and Simon Richmond specifically for this treatment, and it's clear that a lot of thought has gone into the way that the various stages of the treatment tie into the music. The treatment begins against the background of sounds of busy everyday life, and the first song is, of course, 'A Hard Day's Night'. By the end of the treatment, over an hour later, as Golden Slumbers played in the background, I felt relaxed, but also energised and refreshed. The soundtrack was a perfect background for the treatment throughout the whole session, but there were a couple of elements that I really, really loved. The hand massage took place to "I Want to Hold Your Hand" (what else?!) and "Flying" provided the backing track to the part of the treatment that had been inspired by the Beatles Cirque de Soleil show, Love, and involved the use of ribbons. Although I enjoyed the whole of the treatment, that was my favourite part and my only regret was that it didn't last for longer! At the end of the treatment, I was left alone to relax and meditate for a few minutes before getting dressed again, and then joining Helen for tea and biscuits! Everyone who has the treatment also is given a Golden Slumbers bath bomb to keep the feelings of peace, calm and relaxation lasting even longer. So -- in summary -- a unique spa treatment that left me feeling wonderfully relaxed and yet energised, fabulous Beatles music, tea, biscuits and a present at the end of it! All in all, an absolutely perfect afternoon at Lush Spa Liverpool. Before the treatment began I was dreading it, and now I can't wait to go back and do it again! If you're used to massages, you'll love this treatment. If you're like me, and think that massages aren't for you ... you'll love this treatment! The Hard Day's Night treatment is exclusive to Lush Spa Liverpool. To find out more, or to book an appointment, telephone Lush Spa Liverpool on 0151 236 6952 or visit the website by clicking HERE! International Beatleweek 2014 - On Sale Now! The Christmas London Beatles Day is This Sunday! 'Good Ol' Freda' Set for TV Airing in UK!